Synapse Gauge use a high accuracy Swiss stepper motor for indication and mated with a purpose-built high accuracy piezo-ceramic sensor. Most feature peak hold and memory output. Gauges, yes no respectable car guy wants to be caught without one. 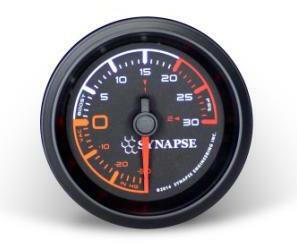 Having gauges means you know what your engine is doing, going, performing, power making, etc. You’ve likely stepped up a notch above the average guy on the street because you want to know what’s actually going on in your engine. Everyone makes gauges, they are a commodity. Or at least, they’ve been made to be looked at as a commodity. What’s so special about these Synapse gauges besides simply looking pretty and cashing-in on everyone’s need to have them? Isn’t that why you bought a gauge in the first place? Some of you know that we’ve had intent for quite some time to put out these gauges, even having them appear on the Two Guy’s Garage TV show. But something happened along the way. We started testing the sensors (sending units) that were being used by various suppliers out there and guess what? They weren’t accurate. We could never get one to line up with the numbers coming off the standalone or the dyno, or the 12 volt $1200 sensor on one of our DAQs (Data Acquisition System). So then the quest for a quality sensor began, especially one that is affordable to someone looking to buy a gauge. And we’ve arrived. Our analog dial gauges use a very accurate Japanese stepper motor unit that is very good with robust electronics. But what good does that do if your sensor is junk. So we’ve created a very accurate piezo-resistive (different technology) ceramic sensor that has very good response and linear accuracy at extreme temperatures. In fact, you’ll actually save money if you decide to get one of our gauges because the sensor is accurate enough that you can actually use it as a MAP sensor. This way, what your gauge is reading is also what your standalone is seeing. Surprise, surprise.